The ladder will be adjusted to take account of the box results each month. IF YOU WISH TO BE ADDED TO THE BOXES YOU'LL NEED TO COMPLETE THE FORM HERE. The ladder is made up of boxes with a minimum of 5 members in each. The ladder is two boxes wide except for the top box. The period for each box match is four weeks, except over Christmas when extra time is allocated. The top two players from each box are promoted except in box 2a and 2b where only one player will go up. The bottom two players from each box are demoted at the end of the four weeks. 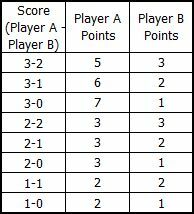 The rankings within the box are determined by 1:Wins, 2:Points, 3: Head to head, 4 Original ranking within the box. Players are requested not to enter boxes if they do not intend to play all matches. Where a player completes fewer than 2 matches in any month they will be automatically omitted from boxes in the following month and will have to re-apply for admission.